Helicrane used for constructing the towers. The continuous humming in otherwise calm BatteWudur, a Karewa once famous for rice cultivation, and located at the edge of Bonen village in Chadoora, some 32 km from Srinagar, can easily be mistaken for a symphony of crickets. But it is not. 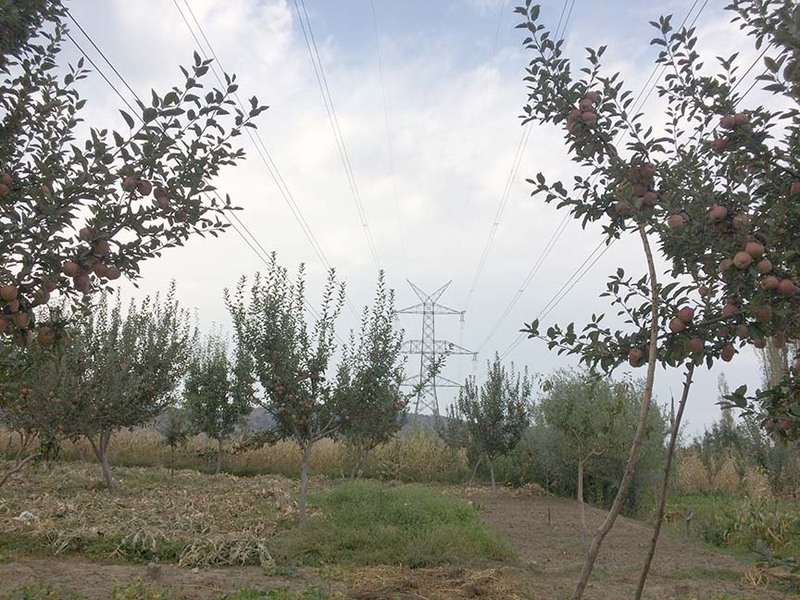 The sound comes from a 400 KV double circuit power transmission line that passes through the Karewa, right above apple, pear, walnut and maize trees, connecting grids in Punjab with Kashmir. The transmission line, Northern Region Strengthening Scheme (NRSS) 29, is Union Power Ministry’s Rs 3,500 crore project connecting Jalandhar (Punjab) with Amargarh (Kashmir). While the older power transmission lines owned by the state Power Development Department and the Power Grid Corporation of India follow the Srinagar-Jammu highway corridor, the NRSS-29 follows the historic Mughal Road to enter Kashmir. It eventually lands in Amargarh (Baramulla). Kashmir’s power transmission set up has followed the crisis of the generation sector. In the late 1950s, a power transmission line would connect Punjab Grid station with Jammu using wooden poles. It is now a history. The major line was 132 kV Udhampur Bemina (Chenaini Srinagar Transmission Line) that was a double circuit line, which bifurcated as it approached Jawahar Tunnel. One circuit moved over the Banihal Pass and the other one passed through one of the tunnel tubes. The latter faced a serious technical issue and was abandoned leaving the only operational circuit above the pass. This is now being used to feed the Banihal grid station from Srinagar. A low hanging trasnmission lines passing over an orchard. The second was 220 kV inter-regional transmission line connecting Kishanpur near Basholito Pampore. This double circuit line is still operational. Commissioned in 2006, PGCI’s 184-Kms long line emerged as the main energy artery that could be charged up to 800MW and was running parallel to the two existing line that PDD owned. The interesting feature of the line is that it takes off as a double circuit line at Kishanpur up to Thathar (108 Kms), bifurcates into two single circuit lines in the Pir Panchal range between Thathar and Qazigund (11 Kms) and then rejoins and reaches Wagoora (65 Kms) as a double circuit line. It involved 520 towers and cost Rs 277 crore. Quite recently, the fourth transmission line was commissioned. Running between Kisanpurand Wanpoh, this 400 kV double circuit line added to the inter-regional transmission systems. But the entire transmission set up was facing one major crisis − all these lines used the common corridor: Udhampur – Batote – Banihal – Pir Panchal pass, for energy transmission which makes the power supply to Kashmir vulnerable. All put together, they would not be able to manage import of even 1200-MW during winters when the demand crosses 3000-MW. “There was a focus on a single grid system across regions but that failed,” one senior engineer who earlier headed the PDD said. “In July 2012, one of the two lines between Agra and Gwalior was shut and the other line was so overloaded that it tripped so profusely that for three days even AIIMS was in darkness.” It was this very incident that led the policy makers to revive the idea of ‘island grids’. That is where the NRSS-29 was born. NRSS-29 is a 400-kV double circuit line that is basically a Special Purpose Vehicle (SPV) wholly owned by the Rural Electric Corporation Transmission Projects Company Ltd. It is an alternative to the existing power transmission infrastructure and is aimed at wheeling more than 1000-MW energy either way. This transmission system has two ingredients: the 400 kV line connecting Jalandhar with Samba, which was commissioned in 2017 summer and the second line that takes off from Samba moves through Akhnoor and Rajouri and finally takes the Mughal Road to Pattan in Baramulla. In the first element of the project, (between Jalandhar and Samba- only 27 kms270 chain kms (ckm) and 77 of 356 falls in J&K. But from Samba to Amargarh, the NRSS-29 will cover 574 ckms (250 kms length) dotted by 783 towers. The line connects Baramulla, Budgam, Pulwama, Poonch, Rajouri, Reasi, Samba, Kathua and Jammu, perhaps the only line that connects 11 major towns. For many in Kashmir, it is the second major connectivity with Pir Panchal Valley that was linked by Mughal Road only. “Now, I hope a pooling station comes up in Kishtwar that will have a direct connection with a substation in Kashmir through the Senthan Top that also is a road,” one retired engineer said. Kishtwar, the epicentre of the power generation in the state is expected to have a pooling station because projects with a cumulative capacity of almost 5000 MW are coming up in the region. The project was handed over to Sterlite Grid Limited on August 4, 2014, on tariff-based competitive bidding (which is better than PGCIL system that worked on a cost-plus basis). It has been charged last month and is up and running. The project was bagged by the company at a levalised tariff of Rs 437.705 crore, a year and post commissioning, the company will own and operate the line for 35 years. 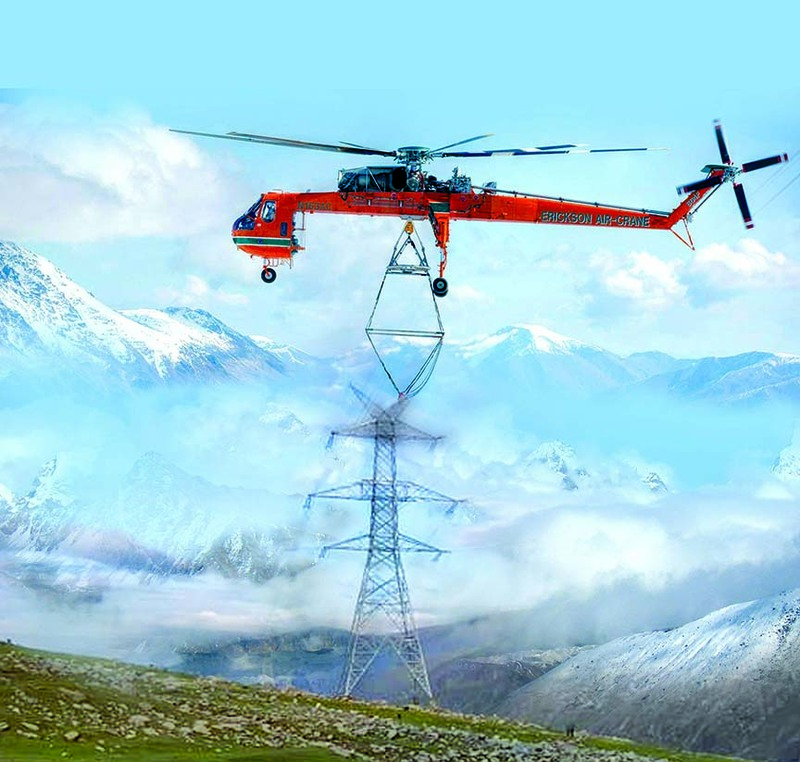 In order to ensure that the company is able to implement the project in harsh weather conditions, Sterlite Grid Limited hired S64 helicranes from US Company, the Erickson Incorporated to airdrop almost 3500 tons of materials on the mountains at an altitude of 3505 meters to install 160 towers. The use of helicranes helped this project emerge as the first one in India’s history in which heavy-duty flying machines were used. Discovery Channel actually shot a 45-minute documentary – Extreme Tech: Corridor to Kashmir, on the use of helicranes in the implementation of the project. The documentary, perhaps the only detailed account about the implementation of the challenging project between an altitude of 415 meters and 2760 meters above sea level involving the inhospitable Pir Ki Gali, a 3000 meters pass, separating Kashmir from Pir Panchal valley. It has detailed the making of the transmission line that is the only direct connection between the Northern Grid and Kashmir. Offering an inside view, the film suggests that the designing engineers devised four types of towers – each with an average weight of 40 tons, were designed to suit the diverse terrains: mountainous and snowy; plains with snow and plains without snow. Operating from very close to the Line of Control (LoC) at Bafliaz, the 10-member crew would fly the helicrane from Srinagar on daily basis but would stick in Kashmir for days because of inclement weather. But once in operation, world’s most heavy-duty fling machine would fly with a premixed concrete bucket of six tons, huge steel loads and even the prefabricated parts of the towers. Company’s American partner had flown highly skilled engineers who knew the art of managing the air-borne loads while on work on the towers. It also offers the breath-taking real-time footage of how pilots, engineers, mechanics and highly skilled professionals synchronised the entire operation despite having language and cultural barriers. “We knew it that it was the most difficult project ever implemented in India,” one company executive was quoted saying. “We knew it that if we could do this, we can do any project in India.” While the first part of the project was implemented one year ahead of the schedule, the most challenging second part was also completed ahead of the schedule. For managing the security situation, the company sought help from the army for security. They were not permitted to use wireless because of the area’s closeness with the border forcing the company to train the ground staff in use of colourful flags and signs to communicate with the helicopters. It has almost hit the target. The other interesting feature of the project is that since the company is a non-state subject, it could not acquire even a single inch of land in its name. “Had the company raised funds for this project on a stand-alone basis, it might have never come up,” one insider said. “The entire land that was used in the project was acquired in the name of the state-owned PDD.” Roughly the project acquired around 1500 kanals of land. But for achieving the target and adding key infrastructure to Kashmir, many people accuse the company of triggering mass sufferings in Kashmir periphery between Shopian and Baramulla. The company has been accused of using short-cuts and bypassing local systems and processes to manage the project. “They have not only ruined our orchards but our lives too,” said Fatah. In 2012, Fatah’s daughter, Kulsum, 23, recalls how on a summer afternoon, three men came to her orchards with a box of yellow-paint and a brush. They marked an apple tree and wrote on it 400 KV D/C. When finished, the men with paint-box left in hurry, avoiding any contact with the natives. “When I asked what they were doing, they said nothing and left suspiciously,” recalls Kulsum. Since then such “suspicious” visits became regular as more men with paint-boxes and telescopes arrived in Batte Wudur and its surrounding villages. However, the actual work on transmission towers and lying of wires began in March 2017. Interestingly, before starting the work, no notices were served to any villager. “It all happened verbally,” said Mushtaq Ahmad Lone, 30, a local Right to Information (RTI) activist, whose four kanal orchards directly get affected by the transmission line. During the process of construction of transmission towers, for which Sterlite had to move building material through orchards, a number of trees were damaged. “They damaged seven apple trees in my orchards completely,” said Lone. Lone received Rs 1.5 lakh as compensation against damage to the crops and Rs 60,000 for using his orchard for moving material. “But they don’t understand how long it takes for an apple tree to bear fruits,” rues Lone. Besides, Lone alleges that a number of walnut and keal trees were axed without even seeking permission from concerned government authorities. “They negotiated with farmers on their own and then cut these trees,” said Lone. Over 45000 trees were cut to make way for 400 kV transmission line. At over two hundred meters distance from Lone’s orchard stands Mohammad Ashraf Chopan’s walnut orchard. Chopan, 36, hails from Dambal, a village 10 kilometres south of Bonen. The income from the sale of walnuts helps Chopan’s family manage their expenses. It was Chopan’s mother Mugli, 65, who inherited these two kanals of the walnut orchard from her father on her marriage. “Last year, I sold walnuts for Rs 10,000,” said Chopan. Like other farmers in BatteWudur, Chopan blames Sterlite officials for ruining his orchard by moving tractors through his fields. In 2017, while making bases for transmission towers, a make-shift road was cut through Chopan’s orchard. “They gave me just Rs 10,000 as compensation for the damage they caused to my field,” said Chopan. But more than the damage to his crop, Chopan is worried about working in his field once the transmission line is fully functional. 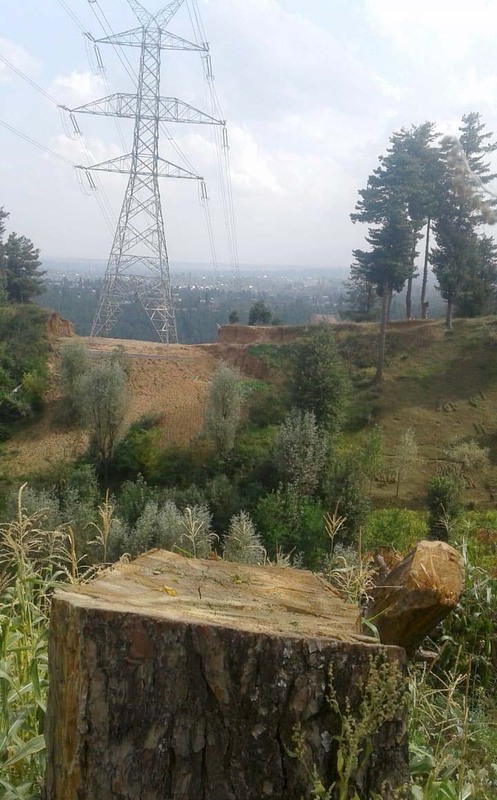 The same concern is giving sleepless nights to almost every apple grower in Budgam and its adjoining areas, from where this transmission line passes. On August 21, 2018, at 8:55 pm, the silence in Bonen village was suddenly broken by a loud roar. Located on top of a hill, villagers quickly rushed out of their houses, thinking it was a cloudburst. “But the sound was so fierce that everyone panicked,” said Fatah, who lives barely a hundred metres from the transmission line. As villagers started looking for the source of the sound, Lone and a few other volunteers rushed towards the BatteWudur, trying to figure out what was happening. “The sound was coming from electric lines passing above us,” said Lone. Stunned Lone and other rushed back to Bonen village and informed people that the transmission line was now functional. “They are not telling us about its harmful effects but we are not fools. Go and see how much noise it makes right now,” said Chopan angrily. Since the day transmission line became functional, Chopan and other villagers are afraid to work under the lines. “I feel pain in my back and sensation in my entire body while I work in my field,” said Chopan. The next morning, when Khanday went back to his orchard to weed out unwanted grass, he once again experienced the same. “This time I was having a headache too, something I have never experienced in my life,” said Khanday. When Khanday shared his concerns with other villagers, it opened a Pandora box of similar experiences. “It is impossible to work in our fields now,” said Khanday. 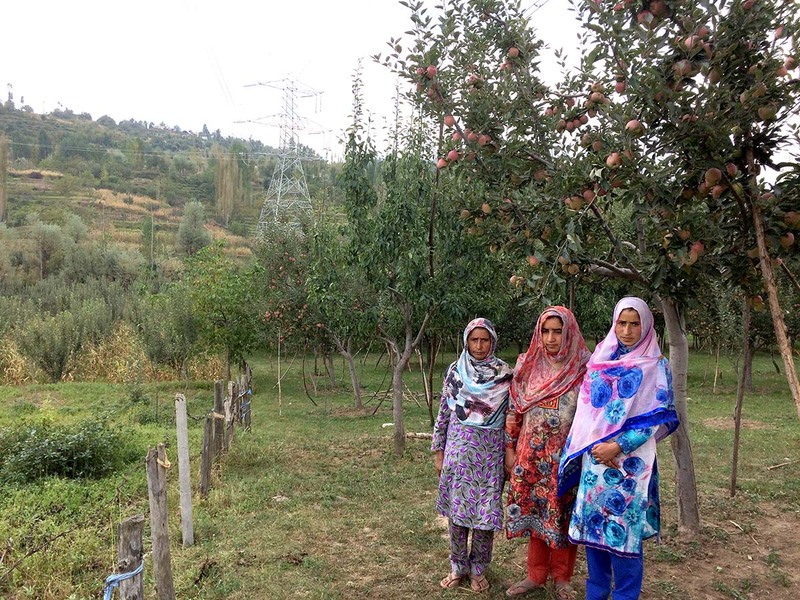 Fatah Begum with her daughters in their apple orchard in Batte Wudur, Budgam. The option to switch over to some other crop was already taken when rice producing fields of BatteWudur, became apple and pear orchards. Exactly twenty-two years back, it was Fatah’s husband Ghulam Ahmad Sheroo, who decided to try cultivating apple and pear on BatteWudur, after five consecutive failed rice crops. Within two years, entire Bonen village followed Sheroo and converted BatteWudur into orchards. Lone apprehends administrative and political nexus for rampant felling of fruit-bearing trees and devastation to orchards. Lone blames that most of these trees end up in the hands of timber smugglers, as officials fail to protect them. “This transmission line has proved lucrative for a lot of people,” blames Lone. Raja Muzaffar blames forest officials for selling prized forest timber cheap that was felled to make way for the transmission line. “They took just Rs 48 crore as compensation for these trees. They were worth over Rs 200 crore at least,” alleges Muzaffar. Nobody in the government is in a position to offer an idea about the land that the line used. The company changed the direction of the line over the mountains – it was so inaccessible that managers offered a google map and not the GT sheet, and the diversion required 58.43 hectors of forests. But with two lines already functional Lone and his team is not ready to give up. “We will fight for justice. Either they compensate us properly for making our land unusable, else we will seek legal help,” said Lone. But for Fatah, who doesn’t understand the complexities of politics, believes yimancheh power Punjabasdyun…asi korukh azaab (They want to give electricity to Punjab at the cost of our miseries). At 400/220 kV Gas Insulated sub-station at Amargarh near Pattan, a LILO is actually linking it with the Uri powerhouse, an NHPC owned second phase power station that has enhanced generation after the Kishanganga powerhouse diverted most of the Neelam water into Jhelum. 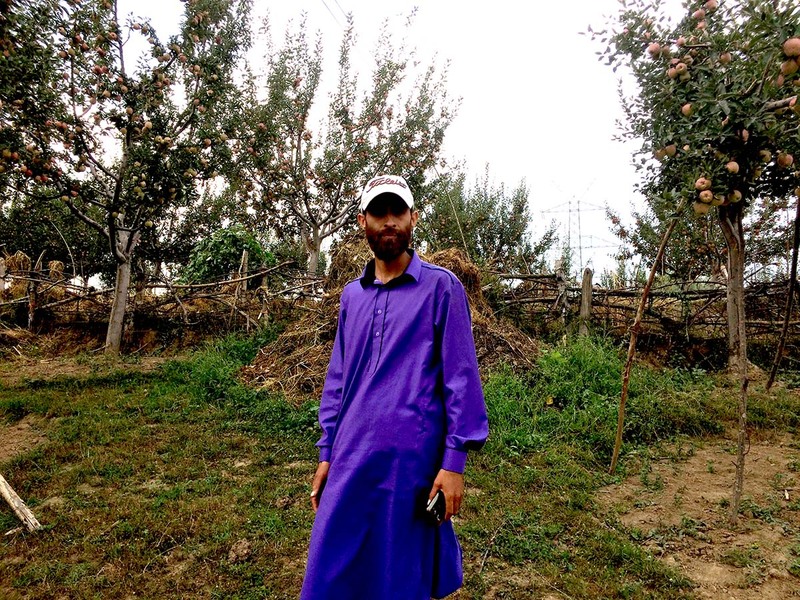 Bilal Ahmad Lone standing near his orchard in Bonen village of Budgam. The company says it paid for 372.535 hectors of forest land and later took another patch of forest land for re-aligning the line. In both the cases, the overall compensation, it paid was Rs 472032762. For utilising 77.51 hectors of the land of the Hirpora sanctuary, it paid a compensation of Rs 422819550. The line required felling of more than 400 trees that Social Forestry Jammu owned and they were given a compensation of Rs 847942. The company had marked and paid for cutting of 41686 trees in forests but eventually, it axed only 11449 and saved 30237, which is 72.5 per cent of saving trees. “We paid for these trees but still did not cut them,” the official said. This is in addition to the private property that the line required. Company sources said they dispensed a cash of Rs 110 crore for acquiring the private land involved in the implementation of the project. Besides, it also spent Rs 115 crores for managing projects ROW (right of way), which includes temporary use of spaces and the trees which need to be axed. “The entire land compensation was paid through the collectors,” a company insider said. “There is not a single tree, even that of a willow, that we did not pay for because this was part of the project,” the official said. “But you must know, excepting Europe and parts of America, the power utilities do not pay for the land that comes under the line between two transmission towers.” This, he said, is a policy issue that lawmakers and the government must decide about. He admitted of some problems in Khan Sahab area and said the axing of trees included a good number of walnut trees as well. Now the line is operational. Is PDD going to import more power this winter?